For more formal affairs we suggest our Capital Ballroom - at approximately 1,200 square feet, this impressive venue is our largest. Stunning ring pendant chandeliers add a level of elegance and enchantment befitting of your special day. For more modest events, we offer our three flexible suites - the Twain, Stowe, and Hepburn rooms. At 600 square feet with seating for up to 50 in each room, these rooms can be used separately or semi-adjoined. Each suite offers ample pre-function space and provides balconies that overlook the Goodwin Square Atrium below. Large weekend events may be hosted in the Goodwin Square Atrium with seating space for over 250 people. With high ceilings and an ample area for seating and dancing it is the perfect place to host a monumental event. The business heartbeat of Hartford happens downtown – and The Goodwin puts you in the center of it all. Corporate guests enjoy being near some of the city’s largest corporations, not to mention a growing list of dining, shopping and entertainment destinations (because you can’t work ALL the time). Rightfully referred to as “America’s insurance capital”, you’re in good corporate company while staying in the Hartford area. And to help you conduct your business more comfortably and more productively, The Goodwin provides the ideal setting for any presentation, launch or catered event. Choose from our impressive Governors or Constitution Boardroom, flexible 3 Suites, or expansive Capital Ballroom to make your next event more sensational. To that end, you can expect full audio/video capabilities for any Goodwin space you choose. Events of every conceivable sort can be enjoyed here at The Goodwin. Social gatherings, business meetings, milestone celebrations – holding your special event in one of our truly unique rooms ensures a sensational and memorable time. In classic Goodwin form, our staff will go out of its way to deliver a smooth and enjoyable experience. Formal affair? Wedding? Grand celebration? At 1,192 square feet, the Capital Ballroom is our largest venue. 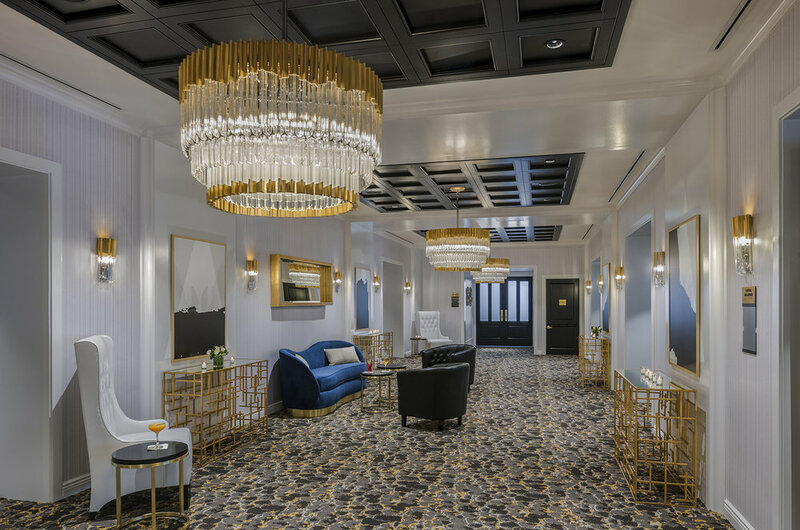 With its eye-catching ring pendant chandeliers and coordinating sconces, it definitely sends the right message to your formal guests. Or perhaps you’d prefer The Goodwin’s take on traditional conference rooms, The Constitution and Governors Boardroom. Featuring rich black walls with contrasting white trim and ergonomic task chairs adding a touch of practical convenience to this character-filled space. The Governors Boardroom also offers an elaborate set of 12 glistening pendants suspended over a brilliant white marble conference table and a decorative fireplace.